Shipman Knotts sits at the southern end of a long ridge of high ground that runs south from the Kentmere Harter Fell. It could be seen as simply the southern end of Kentmere Pike, the second summit on that ridge, but doesn't really feel like part of that fell. 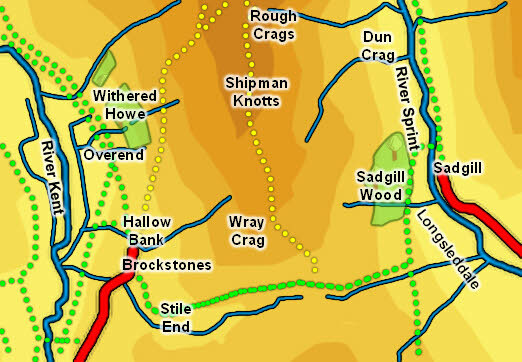 The ridge runs south-east to Goat Scar, where it turns south and Shipman Knotts is at the end of that southern ridge. The summit also sits at the top of a long steep climb up from a pass connecting Kentmere and Longsleddale. There are three routes to the top of Shipman Knotts. The only direct climb comes from the south - at the top of the pass from Longsleddale to Kentmere turn onto a steep footpath that runs alongside a stone wall up the rocky southern slopes of the fell. From Kentmere the fell can also be climbed using the diagonal paths that run above Withered Howe on the way to Kentmere Pike then turning right at the top of the ridge to reach the summit. The third route is to come along the ridge from Kentmere Pike, following the stone wall all the way (apart from a brief diversion to visit Goat Scar). We visit Shipman Knotts during the Kentmere Round. The summit itself sits above the rocks and is a gently undulating grassy area with a few rocky outcroppings. There are steep rocky slopes to the east and south, moire gentle grassy slopes to the west and a slight dip before the climb up to Kentmere Pike to the north. Nameless becks run east and west from the top of the Longsleddale-Kentmere pass, running into the Rivers Kent and Sprint. A large number of equally nameless tarns run down the western and eastern slopes of the fell, again all running into the two rivers. Shipman Knotts has no tarns.